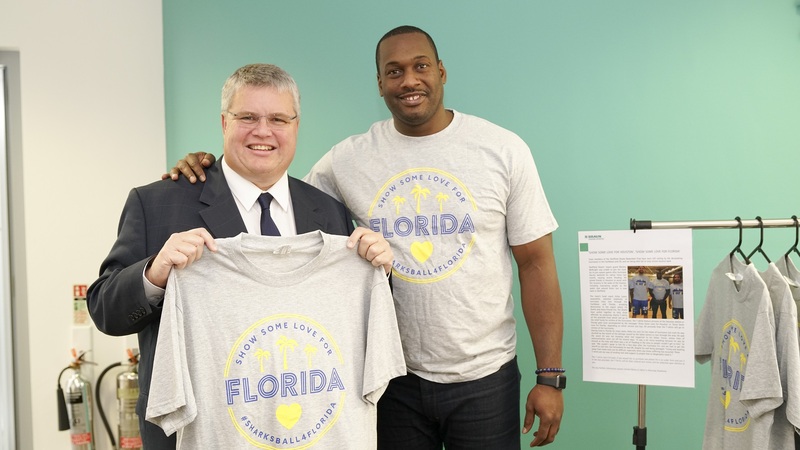 Leading Sheffield firms have added their support to a t-shirt appeal launched by professional basketball side DBL Sharks Sheffield to raise funds and awareness for those affected by recent natural disasters in the USA. Sharks’ naming rights sponsor, DBL Logistics, and main sponsor B. Braun Medical Ltd, have both pledged their support for the ‘show some love for Houston’ and ‘show some love for Florida’ t-shirt appeals, launched by the Sharks to raise funds for the victims of hurricanes Irma and Harvey, which recently devastated the US states of Florida and Texas. Several Sharks players and coaching staff, including Houston-born point guard Mackey McKnight and head coach Atiba Lyons, who is originally from Florida and is fronting the appeal, have been directly affected by the natural disasters. Lyons said: “Many of us here at the Sharks have been directly or indirectly affected by the recent natural disasters over in the USA, and we wanted to show our support for our friends, family and everyone affected back home. “Several of my friends and family who live in the region that Irma ripped through have been left with devastation in her wake – on a personal level, my father’s home was severely damaged, as well as that of his neighbours and friends, who suffered severe flooding too. David Clarkson, managing director of DBL Logistics, said: “The devastation caused by natural disasters such as hurricanes over in the USA is unimaginable to us back home, but for several DBL Sharks players and coaching staff it’s all too real. Brian Chapman, general manager at B. Braun Medical Ltd, said: “As a partner of the DBL Sharks Sheffield and an organisation which supports some excellent causes, it’s our responsibility to support great initiatives such as this. The post Sharks sponsors ‘show some love’ for shirt appeal appeared first on BBL – British Basketball League.